During my wine sales days, the one tool I returned to more often than any other, except for a corkscrew and a glass, were maps. For many years, heavy tomes or some bad copies from those heavy tomes accompanied me on my sales calls. There is no substitute for visual reinforcement when it comes to educating. And that is what I did more than sell. I explained and demonstrated what made one wine different from another. This set me apart and grew my business. Now we all have this information at our fingertips, assuming you know the right place to find it. There are some great map resources out there - and more coming all the time, here are a few of my favorites. The first two are excellent for global exploration, you can drill down to fairly specific regions. Play with them and decide which ones give you the style and look you like the most. These links will be placed in the Resources section as well. On the occasion of drinking some fun wine with friends in the wine business last night, it seemed a perfect opportunity to open the last 1998 Oregon Pinot Noir in my possession. The vintage created excitement about the region and the grape and paved the way for a good string of vintages that cemented Oregon's place in the upper echelon of Pinot Noir production around the globe. A few quick facts, straight from the back label (love a label that actually informs! ): Elevation about 440 feet, Willakenzie soil, grapes planted in 1990, farmed organically, harvest was a mere 1.1 tons/acre, the wine spent 19 months in 43% new barrels (I assume French), no fining or filtration. Amusingly, the final line is, "will benefit from up to 6 years of bottle age" - or 15 apparently! Here are my tasting notes for the same wine opened in 2009. I was thrilled to find no iodine note and the wine showed brilliantly as soon as it was poured. Fresh earth and just small hints of mushroom mingled with some dried berry aromas, providing that rare experience where smelling the wine is almost enough. The palate was the highlight though. Silky, seamless and with incredible power still, the wine filled the mouth and I'm not sure I could conjure up another wine I would have chosen over this palate experience. The finish could not live up to the excitement created by the nose and taste, however. While it didn't fall flat, it clearly lacked some focus and staying power. The other parts more than made up for it and the wine vanished all too quickly. I am amazed at how happy I was with the wine based on those earlier notes. 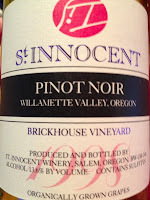 For those interested in some other 1998 Oregon Pinot tastings, here are two more links. 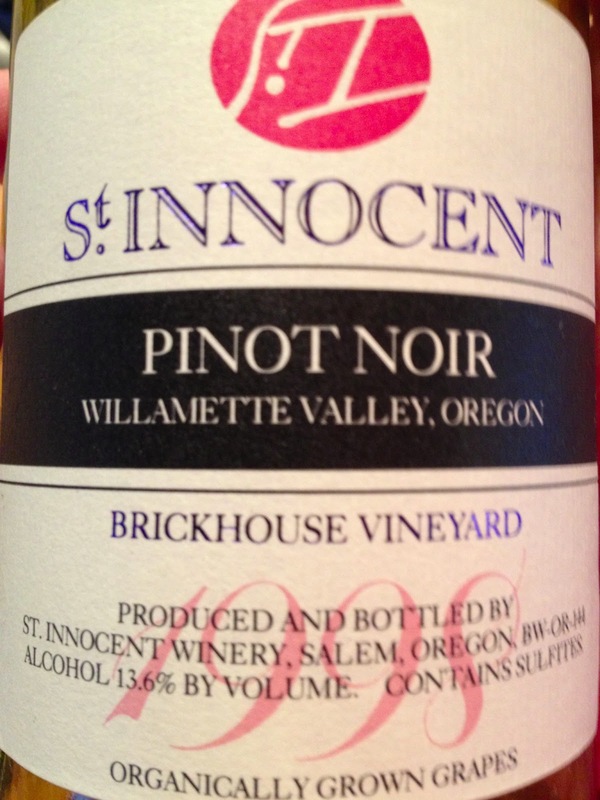 St. Innocent remains a leader in producing top-notch Pinot noir and if there was to be a ranking of Oregon producers, they surely would merit Grand Cru status. As I read a recent Seth Godin post * it brought me back to my wine days and the insanity of distribution and the games played in the pursuit of making suppliers happy. He laments not seeing any of his books in any airport bookstores during a whirlwind tour. After sharing this news with his publisher, "Someone wrote back, 'Seth, if you tell us which airports you'll be visiting, our salesforce says they will do their best to have your book in a place you can see it.'" Clearly not what he was after. The wine market often functions in this same dysfunctional way. Regional or national representatives come to town and the local distributor for the supplier's products tries to find out (or control) where the rep is staying and eating to guarantee the wines will be available. In some cases this is appropriate - go support those who are supporting you - but this is not always how it works. What if the chosen restaurants have no interest in the products? What if the wines have never been presented? Then the give-aways begin. I remember a local rep for one of the two big wholesale companies in New Orleans walking into Martin Wine Cellar, where I worked, and offering us a free four case stack of $13 a bottle wine if we would display it for a few days while a market survey was conducted. He went further and told us whatever we sold could be profit for us and they would pick up the remainder next week. Never mind the illegality of selling alcohol on consignment in Louisiana. Never mind that he knew no amount of sales was going to magically create a "permanent" stack of the wine in the store. The company was creating false success for the survey. They do deplete more bottles from inventory but they are not building a sustainable distribution model. They are building, as Seth says, a Potemkin village (the link is here because I had to look it up). I always pictured a set from a western movie, storefronts, but no insides, just support beams to keep the facades from falling over. In restaurants, the same thing happens. "Could you feature this wine by the glass this week? We'll give you a case." Or perhaps, "We'll give you four bottles and reprint your list for you if you could add this wine for a few days." There is always this lonely, outsider grasp at hope that the wine will be so successful that the placement will remain and the outlet will actually order (and pay for) the wine in the future. This is the teenager doing favors for someone they have a crush on. In my experience, these efforts go unrequited and your time and energy is much better spent doing almost anything else. Don't waste your limited resources on those turning a deaf ear, find prospects willing to listen and join your team. As Seth puts it: "Don't save the canary. Fix the coal mine."